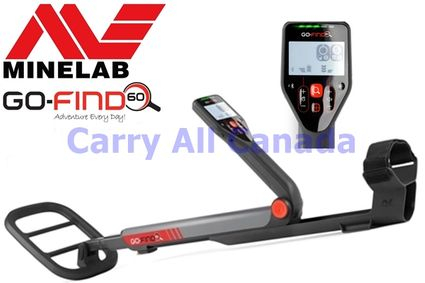 Minelab GO-Find 60 Metal Detector is a unique detector with advanced electronic and mechanical features. It will find coins, gold and diamond rings, gold and silver jewelry, relics and valuable artifacts, buried and hidden treasures, the model 60 is more than just another metal detector, it’s not like anything you’ve seen before. The 60 is tomorrow’s technology today! It comes with the powerful deep searching NewShape ten inch search coil for greater scanning coverage, target separation and “Quick Response” to ground targets. Use the coil on land, beach or in water to two feet deep. All controls are in front of you, easy to see. Use one finger to select what you want to find, discriminate or eliminate unwanted “junk” targets, increase or decrease depth, pinpoint your finds. Meter also displays icon picture of your finds. Know your target before you dig. All this and more features are in a regular full size metal detector now compressed into a lightweight, compact and collapsible 22 inch modern 2015 metal detector. Powerful, well built, lightweight, less size, easier to carry, pack or transport. You no longer have to settle for the larger heavier metal detectors with older technology! Ranked high in test trials and suggested for beginners to seniors and experienced detectorists. GO-FIND 60 with Bluetooth integration connects to your Smartphone Pro App at no charge. (FREE). With the Pro App you can, remotely control your metal detector, record finds on Google Maps, identify common coins, view detector information, even play music and more. You do NOT need to use the Bluetooth App to operate the GO-FIND 60 , it’s an added feature users have been asking for, and it’s yours FREE! If you can use a cell phone, you can use your Smartphone App. Pack a GO-FIND for your next trip, it’s awesome fun for everyone!